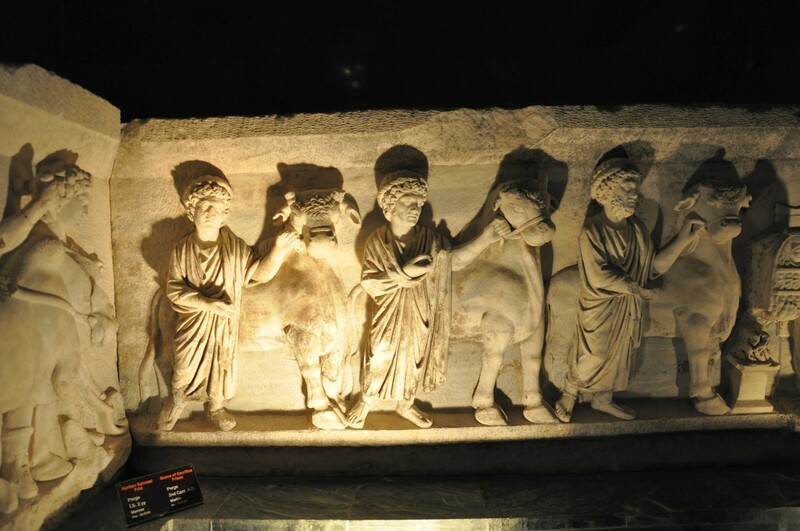 Archaeological Museum in Antalya is one of the best venues of its kind in Turkey. The exhibits shown here come from the archaeological sites from Antalya Province and make a great addition after visiting these places. The most important sites represented in this museum are: Karain cave, ancient city of Perge and the cities of Lykian civilization. Both the wealth of museum collections and their presentation in spacious, modern interiors encourage the visitors to can spend many hours in this place. The uniqueness of this institution has also been recognized internationally - in 1988 the Council of Europe awarded it with the Museum of the Year Award. The first museum in Antalya was founded in 1919, just after the First World War. The teacher Süleyman Fikri Erten, who saved many archaeological pieces from looting, decided to create for them an appropriate venue. Initially, the collections were exhibited at the Yivli Minaret mosque, located in the historic Kaleiçi district. In 1972, a new building was constructed, on the western side of the city, and the mosque was transformed into the Ethnographic Museum. The building of the Archaeological Museum in Antalya boasts an exhibition space of 30,000 square meters. The exhibits are arranged in several spacious halls, and some of them are placed in the museum garden. 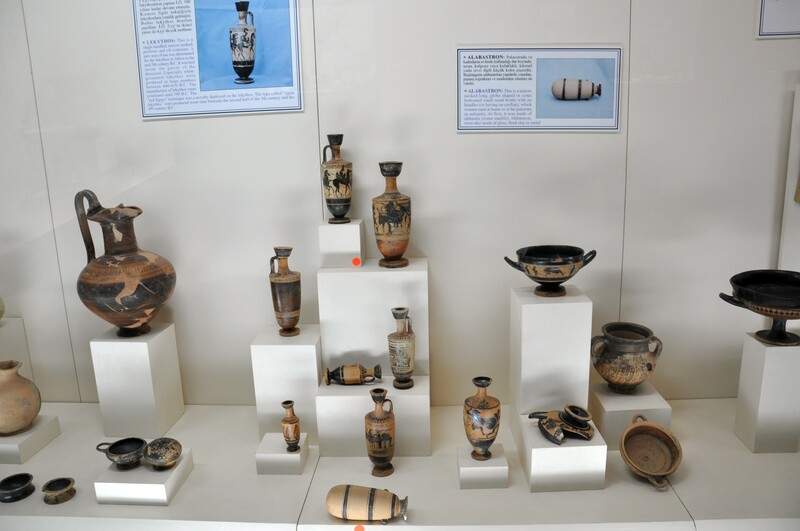 The objects that are in the possession of the museum illustrate many thousands of years of human activity in the region of Antalya. Because of the huge number of exhibits and the vastness of its facilities at least half the day is necessary to fully appreciate its wealth. This small section of the museum displays the fossils and animal bones from different geological epochs. The most interesting specimens are: the shells of huge snails, the fossils of extinct cephalopods, foraminifera shells and anthozoans. 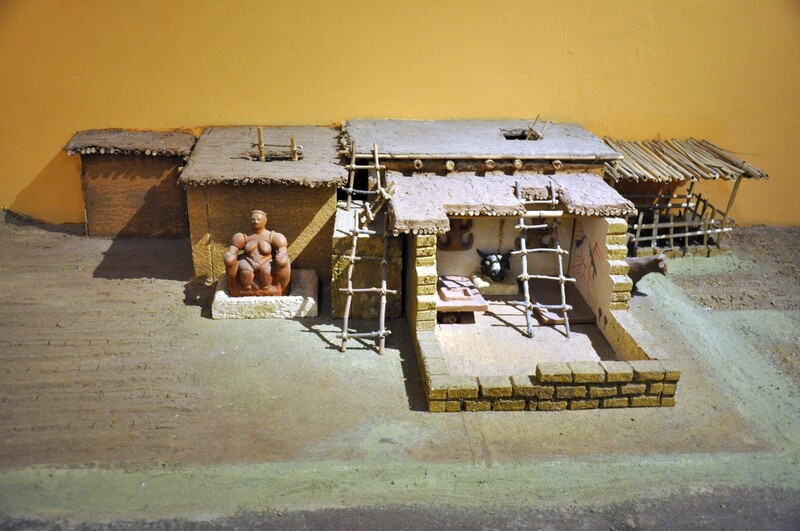 This hall exhibits the finds from Paleolithic, Mesolithic, Chalcolithic, Neolithic and early Bronze Age. 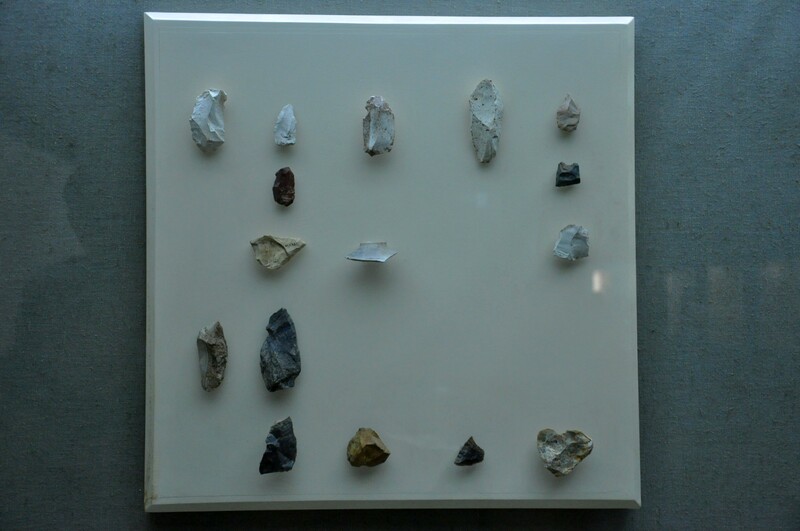 The displayed items are mostly bone and stone tools. Illustrative panels explain the production process of these tools. There is also an exhibition demonstrating the process of leather tanning. The main focus of this exhibition is on the objects from Karain cave, but there are also some finds from Öküzini and Sehahöyük. 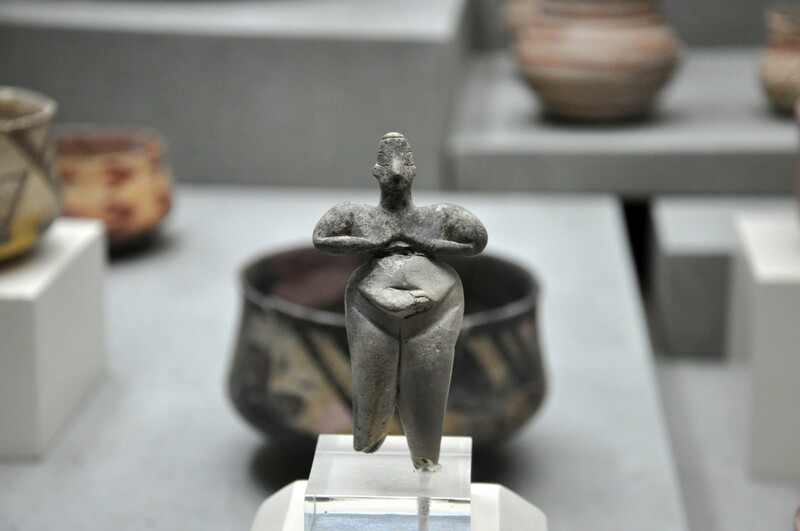 One of the most beautiful exhibits is a figure of a woman, found in Hacılar Höyük, Burdur Province. 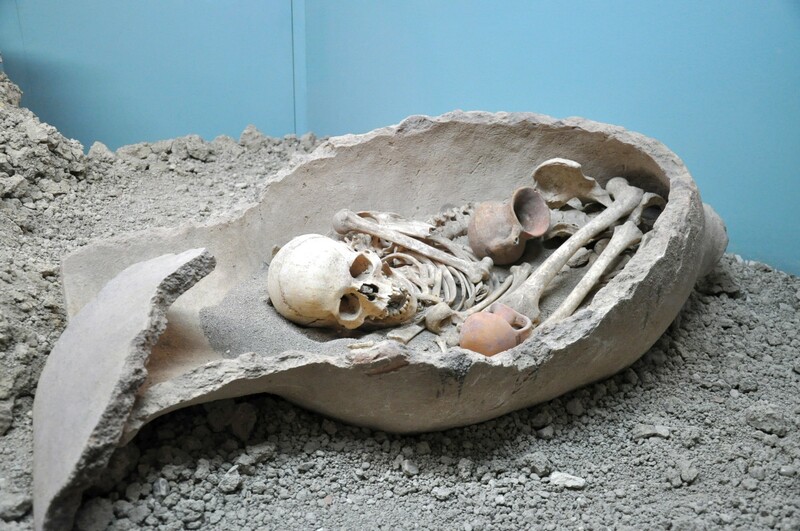 An extremely interesting feature of this exhibition is the reconstructed urn burial from Karataş-Semayük site near the town of Elmalı. On this site an early Bronze Age cemetery was found where people were buried in clay vessels placed underground. These spacious rooms are dedicated to the presentation of small finds dating back to the period from 14th century BC to 15th century AD. The exhibits are ordered thematically and chronologically - there are special sections devoted to the Geometric (the 9th-7th centuries BC), Archaic and Classical (the 7th-5th centuries BC) periods as well as Roman and Byzantine eras (the 5th-15th centuries AD). 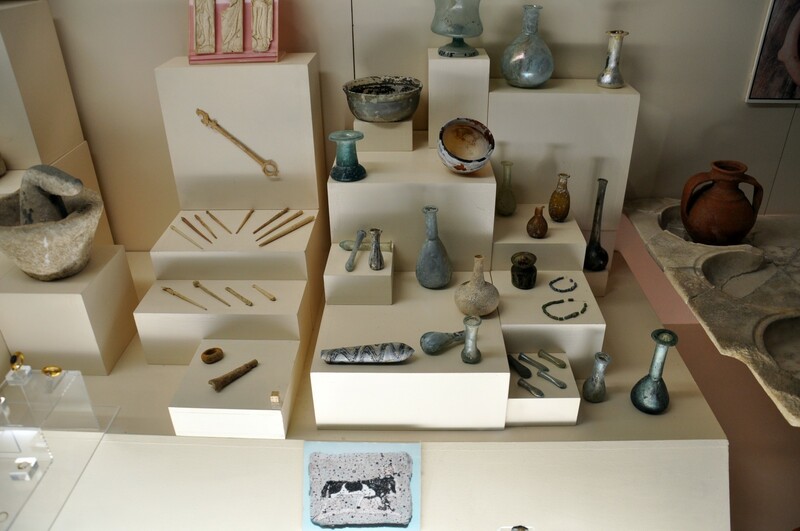 The majority of space is taken by the ceramic finds, beautifully presented and well described. The panels explain the application of such vessels as crater, pyxis, kylix and skyphos. The second section of this exhibition is devoted to particular archaeological sites from Antalya region. They are illustrated by various finds - clay and glass vessels as well as bronze objects and gold jewelery. Moreover, the profiles of the best-renown researchers that devoted their lives to the studies of this region are presented, including Thomas Marksteiner, Jürgen Borchhardt, Arif Müfid Mansel and Fahri Işık. They conducted their research in nearby archaeological sites of Myra, Limyra, Patara, Perge and Side. The center of this hall is used to display ancient mosaics that were found in Lycia region, in Seleukeia and Xanthos. The walls are lined with the statues from various locations, including Hermes and Meleager from Perge and a woman from Rhodiapolis. The most stunning exhibit from this section is a three-headed statue of Hekate, the goddess of the underworld, excavated in Pisidian Antioch. The separate room of the museum is devoted to the exhibition of marble heads well-known and anonymous men and women from the ancient world. These heads were collected in numerous archaeological sites, including Perge, Patara, Letoon and are dated from the 2nd to the 4th century AD. These two halls usually make the best impression on the visitors. They are exclusively devoted to the presentation of the statues from Perge excavations. Most of these statues date back to the 2nd century AD. In the center of Emperors Hall there are the statues of Three Graces and a dancing woman. Along the walls of this room splendidly preserved statues of Roman emperors are displayed, together with their wives and other important figures. Emperor Hadrian sternly observes the visitors and is easily recognized by his trimmed beard. Actually, there are three statues of this emperor in the hall - two of them present him in full armor and one is classically naked. The beard of Lucius Verus is even more impressive, but unfortunately not much has been preserved from his statue. Emperor Trajan is depicted in beautiful armor and, in contrast to Hadrian, clean-shaven. Septimius Severus was portrayed in a playful mood, quite surprising for an emperor known for his serious attitude to life. The imposing statue of a woman is actually dedicated to Plankia Magna who played a significant role in the development of Perge in the golden age of the city. The Hall of Gods, as its name implies, is dedicated to the statues of ancient gods and goddesses. They were also made in Perge, in the 2nd century AD, but in majority are just the copies of older, Greek statues. Naked Apollo stares dispassionately into the distance, Artemis - the goddess of hunting - has lost her bow, Athena's breasts are covered with a buckler from leather scales, with the head of Medusa in its center. Beside the gods from the classical, Greco-Roman pantheon, such as Nemesis and Hygieia, there are also Egypian gods on display. Serapis does not look especially happy, but this impression might be the result of the missing nose. He is accompanied by Isis, however the only trace of her baby Horus are his legs. A separate museum exhibition is devoted to architectural elements and statues that once adorned the theater in Perge. Many of these statues demonstrate admirable dynamics: Heracles is flexing his muscles, Emperor Trajan is standing nonchalantly, the god of wine - Dionysus - is holding his head, probably sore from too much liquor, only Alexander the Great is standing proudly, like the statues from the Archaic period. The central part of the exhibition is a statue of a satyr Marsyas, and the walls of the exhibition hall are decorated with the reliefs depicting various scenes from mythology. The wealth represented by the sarcophagi in this room can make you feel dizzy. These exhibits represent the three main groups of Anatolian sarcophagi. The first group is called Pamphylian is can be recognized by distinctive garlands and the figures of Nike and Eros. They were made in workshops in Perge, and then exported to all corners of the Roman Empire, including Rome. The second group is called Sidemara or sarcophagi with columns. It is most common of the sarcophagi found in Asia Minor, and those that are in museum collections come from Pamphylia region. These sarcophagi are characterized by their decorations reminiscent of the temple with a colonnade. Between the columns, in the form of reliefs, the scenes from the life of the deceased are shown. The most interesting specimen of this kind of sarcophagi displayed in the museum, shows the Labours of Hercules. 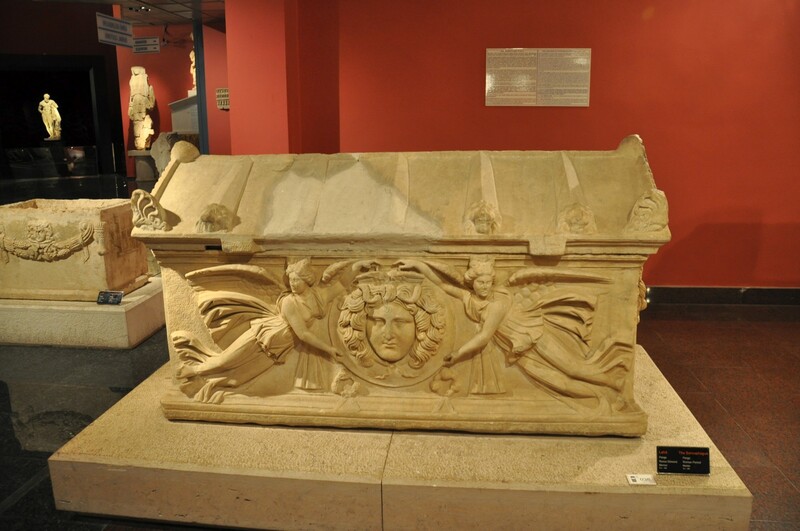 Another wonderful example is the sarcophagus of Domitias Julianus and his wife, made in the 2nd century AD. The most unique sarcophagus in the collection of the museum is the one with medallions. This is only one of its kind preserved in its entirety, decorated with medallions supported by the carved figurines of the goddess Nike. Additionally, there are sarcophagi for children and one, extremely rare, prepared especially for a dog. A separate part of the exhibition is devoted to the funeral customs of the ancient period. Some attention is also devoted to the exhibition of monumental tomb of the king of Lycia - Pericles - from Limyra, the 4th century BC. The icons collected in this part of the museum exhibition come from the region of Antalya and are dated to the period from the 18th to the 19th century. The collected icons are a valuable witness to the presence of the Greeks in the region of Antalya, which ended with the population exchange between Turkey and Greece in the 20s of the 20th century. These icons depict the scenes from the activity of Jesus, the Last Judgement, the Ascension of Mary and the life of John the Baptist. The coins displayed in the museum include the pieces from antiquity, the Middle Ages and the modern era. 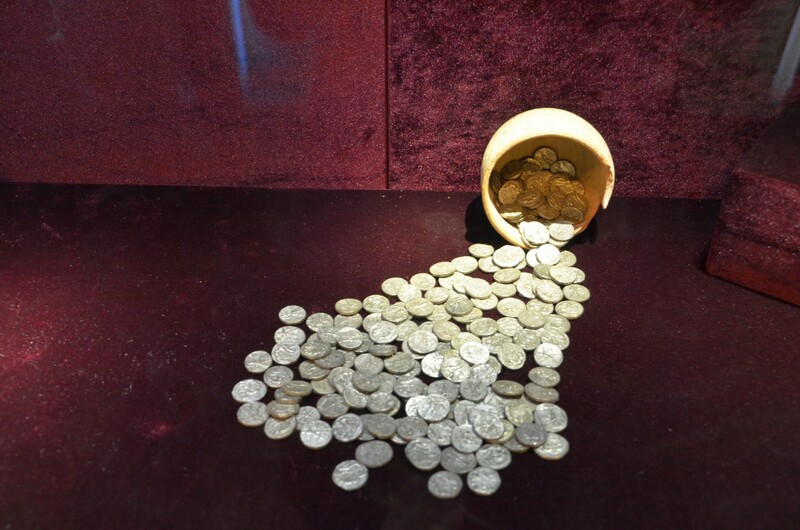 Particular attention of the visitors should be paid to the coin collections or treasures that had been buried for centuries and later discovered intact by archaeologists. A great example of this category is the treasure of Aspendos, which consists of 206 silver staters (Greek coins). These staters, found by archaeologists, were minted in Aspendos, and the latest of them is dated to 350 BC. It is believed that the owner hid his treasure after hearing the news of Alexander the Great approaching the city in 332 BC. The section devoted to ethnographic topics represents a small part of museum collections and seems to have been prepared without the spirit. There are carpets, traditional costumes, weapons, tiles from the Seljuk and Ottoman periods, manuscripts, candlesticks, a large collection of wooden spoons, and even a horse-drawn vehicle. 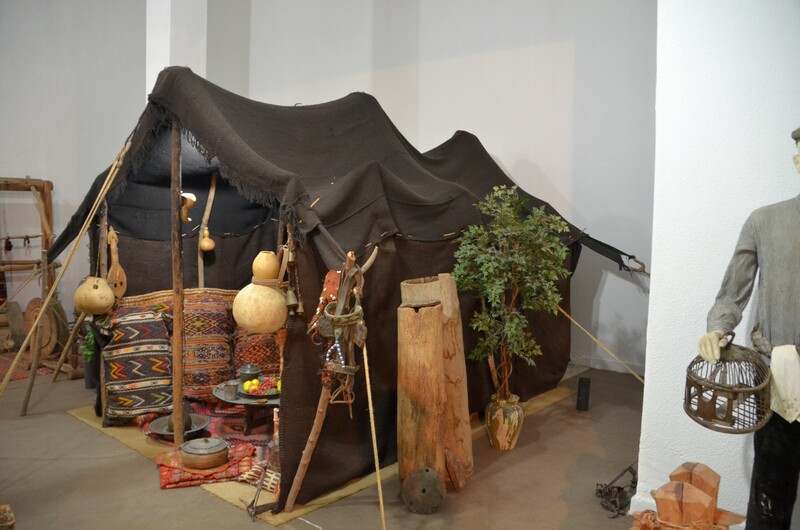 The most interesting elements of this exhibition are the recreated the interior of a typical household of Antalya from the 19th century and the nomadic tent. In a hall specially prepared for the youngest visitors there are miniature models of the most important historical monuments in Turkey. Children can see the ruins of ancient cities of Perge, Aspendos and Patara, take a look into Karain Cave or a household from Çatalhöyük as well as the fortifications of Alacahöyük or admire the Lycian rock tombs of Myra. In the garden of the museum there are mainly stone artifacts from the Roman period, which due to their large size could not be accommodated inside the building. 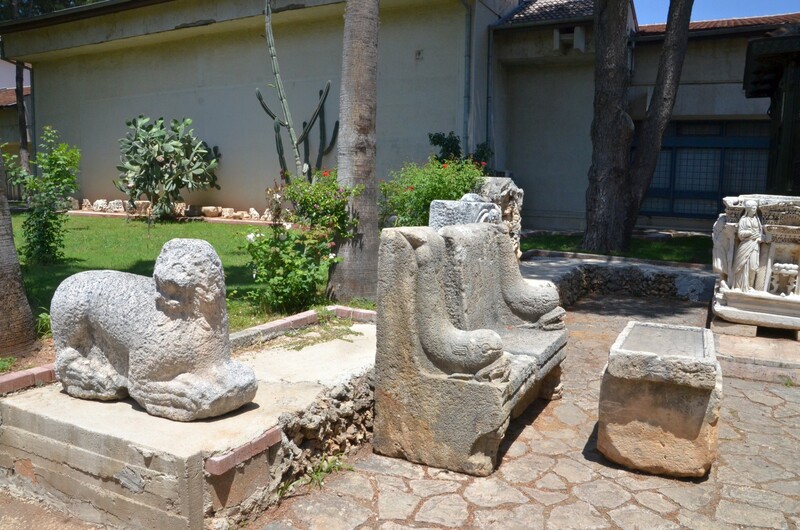 Archaeological Museum in Antalya is located in the south-western part of the city at Konyaaltı Caddesi No:1. The distance to the museum from the historical center of Antalya (i.e. Kaleiçi district) is 2.5 km (1.5 mile). Next to the museum there is the terminal station of a so-called Nostalji Tramvay (Nostalgic Tramway) line that connects the western districts of Antalya with its historical center and the eastern beach district of Lara. The trams run every half an hour, from 7:00 a.m.to 9:00 pm. The regular ticket costs 1.70 TL. 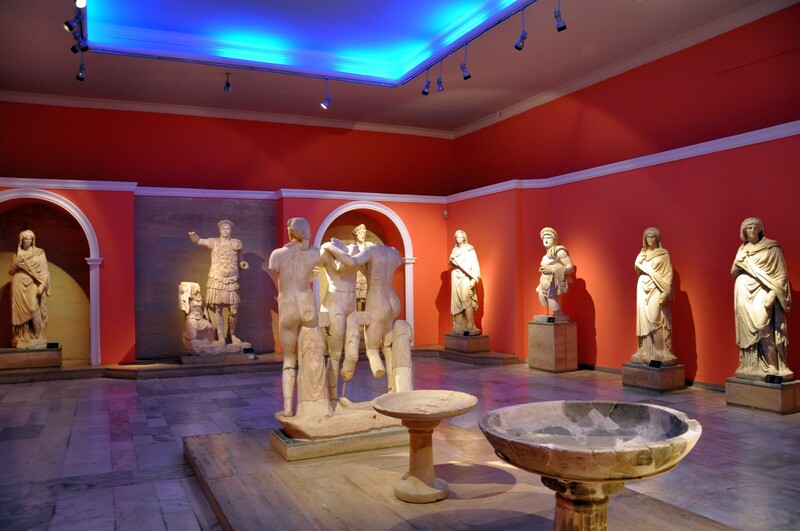 Archaeological Museum in Antalya is open every day, in summer season (from April to October) from 9:00 a.m. to 6:30 p.m. In winter season (from November to March) the visiting hours are: 8:00 a.m. to 5:00 p.m. The ticket costs 20 TL (in 2015). There is a possibility of renting an audio-guide (10 TL) that offers an opportunity to listen to the detailed narratives concerning all museum exhibitions. This system is available in English, Turkish, French, German, Italian, Russian and Spanish. This solution is highly advisable as some of the exhibits have information panels in Turkish only.